March 8, 2018 marked SACCNY’s 112th Annual General Meeting & Board Meeting. The meetings focused on a recap of the Chamber´s 2017 activities, strategic planning undertaking and the presentation of new goals and initiatives, as well as electing a slate of new members to the Board of directors. 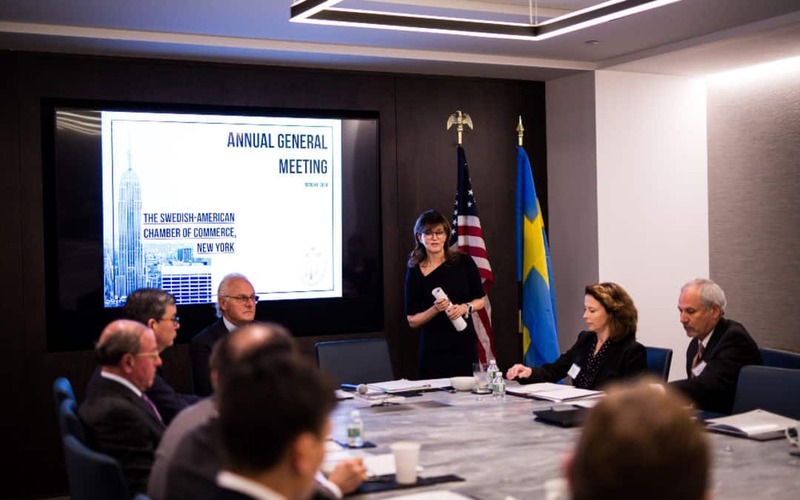 SACCNY’s Chairman Karl Wellner opened the Annual General Meeting by welcoming members on all levels, from Gold—to Young Professionals, some of whom had traveled from Sweden to attend both the meetings and surrounding events. Wellner further expressed sincere gratitude to our host, gold members Newmark Knight Frank, for so graciously and generously receiving us at their beautiful and spacious Midtown offices–which simply could not have provided a better and more attractive venue. The meeting also marked Anna Throne-Holst’s first anniversary as President of the Chamber. Throne-Holst delivered the President’s report, including a summary of the extensive strategic planning process undertaken by herself and staff during the early part of 2017 through a series of internal workshops, resulted in both an updated mission statement and detailed roadmap for updated goals, related events and activities, new and broader business services, as well as updated and widened communications and outreach strategy. In an effort to broaden the chamber’s network, as well as to better create relevance for the expanding tech start and scale-up sector—seeking support and guidance as they undertake the journey internationalizing into the US market—the Chamber has also introduced a new membership category, Small Business Membership, specifically designed for companies with 10 employees or less. Throne-Holst was also pleased to welcome two new gold members, Cevian Capital and Newmark Knight Frank. Click here to see a full list of members. Expanding on the updated mission statement and strategic planning process – based on the question: What does it mean to be the Swedish American Chamber of Commerce in New York today, going in to the future, and how does it develop/stay the course, building on its past, while ensuring it is truly relevant, in fact indispensable, in the 21st century economy and trans-Atlantic business climate? The ensuing discussions, many based on extensive member inquiry and conversation, paved the way for a number of changes and new initiatives within the Chamber´s different activity and service areas—perhaps most notably, project GatewayUSA. The project, which was conceived to best answer the now recognized needs of both current and future members, and when completed will provide a high-end 12,000 square foot professional business platform, including meeting and conferencing space, multiple dedicated offices and desk space, as well as events and workshop arena. The platform will as such provide a “home away from home” meeting, working and networking space in New York City for its members, as well as the burgeoning start and scale up sector emerging out of Sweden. The GatewayUSA project was billed as an important, even vital, investment in the Chamber´s future growth and development. Plans, financing & budget, as well as layout and amenities, were presented and discussed, and Throne-Holst then concluded her presentation stating our intention to open the doors to GatewayUSA in May/June 2018. Click here to read more about the GatewayUSA project. The Annual General Meeting was then followed by a customary Board Meeting, during which the Chamber Chairman and President proudly welcomed nine new Board members, six of whom are women, a net 100% increase in female Board members. Click here to see all Board members. Upon reviewing the Chamber´s overall financial situation, members of the Board immersed themselves in an in-depth discussion on the implementation of project GatewayUSA, at the conclusion of which the project was approved by unanimous vote. “I would like to thank the members of the Board for supporting this important initiative, which we believe will greatly contribute to the long-term prosperity and development of this Chamber. Our incredibly talented and ambitious team has worked hard to find new ways of bringing this Chamber into the 21st century. GatewayUSA will help us stay truly relevant to our membership and mission. I encourage and ask you all to play an active role in the advancement of this exciting project and the future of the Chamber” Throne-Holst concluded. The next Board meeting will take place in Stockholm August 21, 2018.